Reading Australia presents this Ursula Dubosarky podcast, with permission from The Garret Podcast. Ursula Dubosarsky is the author of over fifty books for children and young adults. She has a PhD in English Literature and has won numerous national and state-based prizes. The White Guinea Pig, awarded New South Wales Premier’s Literary Award in 1994. 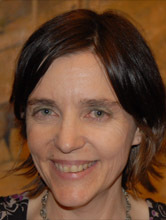 Alongside her fiction for older children, Ursula has also written picture books including The Terrible Plop (shortlisted for the Prime Minister’s Literary Awards in 2010) and Too Many Elephants in This House (Children’s Book Council Book of the Year Honour Book in 2013), which have both been adapted for the stage. Ursula Dubosarsky is widely regarded as one of the most talented and original writers in Australia today. She is the author of many outstanding books, both for young adults and for children, and has won several national literary awards. In 2007 The Red Shoe won the Queensland Premiers Award, the NSW State Literary Award – Young Adult, and was an Honour Book in the CBC Book of the Year Award: Older Readers. Ursula has a PhD in English literature from Macquarie University, and lives in Sydney with her family.